San Gwann and Mdina Knights are not two teams which are well-known to football fans outside Malta, but their BOV Second Division match, played at the Luxol St. Andrews Stadium on 31/1/14, was the first in a veritable mælstrom of matches during a visit to Malta which straddled January and February. Five days before, San Gwann, who were challenging for promotion, gained a hard-earned 3:2 win against Mqabba Hajduks, who were in the Premier League just a few years ago. The same day, Mdina Kinghts, who were bumping along at the bottom of the table, lost by the same score to Siggiewi. A cool evening, interspersed with showers, formed the backdrop to the start of the Bank of Valletta Second Division match between Mdina Kinghts and San Gwann at the Luxol St. Andrews Stadium in Pembroke on 31/1/14. It was not a night for coming out to watch a football match, but if your correspondent decided to brave the elements, around sixty other souls joined him. San Gwann, as expected, set about pressurising the Kinghts' defence, and saw a claim for handball in the opposition penalty-area waved away as early as the third minute. The Yellows' Josef Cutatar and Nikolai Muscat were constantly probing for a way through the Mdina defence for most of the first fifteen minutes, though Ayrton Buhagiar provided a moment of worry for San Gwann with a dangerous cross from the right after 10 minutes which eluded everybody and swung just wide of the far post. His goalkeeper, Mark Aquilana, did well to claw away an inswinging cross from Wallace Oliveira Santos, but could do nothing to prevent Muscat from volleying in the game's opening goal from 10 yards out on 16 minutes after a cross from Alan Borg on the right-hand side; Aquilana joined his more than static defence in watching Muscat's volley fly into the top left-hand corner. Oliveira Santos was proving himself to be a one-man awkward-squad for the Knights' defence in the first half, and was firing shots in from all angles in the minutes following his side's opening goal; meanwhile, there was an entertaining battle of wits developing between his team-mate Cutatar and Knights' defender Daniel Cremona, which was to last until Cutatar's substitution in the 67th minute. Mdina were finding it difficult to gain a foothold in the match, but a cross from Andrea Muscat just evaded Cachel Vella in the 24th minute. Muscat and Emilio Cornago San Pedro were beavering away on the left-hand side of attack for the Knights, but to no avail. The San Gwann defence were looking very comfortable indeed, and a move on the half-hour, involving several of their team-mates further up the pitch, ended with Nikolai Muscat's 20-yard effort trundling wide of Aquilina's right-hand post. Aquilina's involvement in the proceedings came to an early end in the 41st minute when he was clattered by Micallef when going for a cross from Kurt Zahra, and ended up going off with a shoulder injury after being prone for some time; Wallace Galea entered the fray in place of the hapless Aquilina. Mark Saliba's half-volley from 20 yards flew just past the junction of post and crossbar of Galea's goal three minutes after he made his entrance, but the linesman's flag had been raised for offside. The last action of the first half came in the first minute of injury time, when a free-kick was given to Mdina after a foul, followed by the proverbial handbags, on Ayrton Buhagiar by Kurt Zahra; Buhagiar's resulting free-kickhit the Yellows' defensive wall and ricocheted away to safety. The second half began tentatively, but San Gwann were soon back in their stride, with Mark Attard marshalling the defence with aplomb; up front, Zahra tried his luck from long-distance, but his shot was blocked. He followed that up shortly afterwards with a snap-shot from the left-hand side of the Mdina penalty-area which flashed just wide. The San Gwann onslaught continued unabated, and Glenn Fenech headed home on the hour from a corner on the right-hand side, but he was deemed to have committed a foul. Four minutes later, San Gwann's lead was doubled when Josef Cutatar delivered a thumping header, again coming from a corner on the right, which gave Galea no chance. The Knights were finding it hard to create chances of their own, Buhagiar's free-kick from 25 yards out which hit the wall and was cleared being the nearest thing to a shot on goal for the team in black during that period of the game. San Gwann continued to press, and, in the 72nd minute, Borg and Toriano Singleton combined to fashion a move which resulted in Peter Xuereb's shot blocked by a defender; Singleton himself was heavily involved in the the search for goals in next couple of minutes. First, his shot following a jinking run from Xuereb was saved by Galea at the second attempt; then, Nikolai Muscat's volley across the face of the Mdina goal just eluded him at the left-hand post. The same fate befell Xuereb four minutes later from a Xuereb cross, before Mdina finally had a shot on goal worthy of the name; Mark Cremona's shot from just outside the box beat Carbonara in the San Gwann goal but scuttled just past the right-hand post. Two yellow cards for Mdina's Cachel Vella and Daniel Cremona came either side of a Xuereb shot being charged down by their defensive comrades, but it was a sign, belated as it was, that Mdina were not going to go down without a fight. The Knights broke forward in the 86th minute, and a cross from the right-hand side caused panic in the San Gwann defence, but after an acrobatic swipe at the ball by Cachel Vella which missed completely, the ball was eventually cleared downfield. They began to press, and two minutes later, in the 88th minute, were awarded a penalty when Marco Mercieca fouled Cornago San Pedro; there should have been no argument as Mercieca upended his opponent, but the defender said his piece and received a yellow card for his pains. Ayrton Buhagiar sent the resulting penalty high to Galea's right, and, almost from nowhere, the Knights were back in the game, but were unable to pressurise the Yellows' goal for any considerable period of time. Instead, San Gwann were still the team looking the more likely to score, and Singleton was fouled by Nicholas Micallef, who was then booked. The resulting free-kick, taken by Kurt Zahra from some 20 yards out, flicked off the wall and over the bar. In the 92nd minute, Singleton had the chance to put the game beyond any doubt when he evaded the Mdina defence, chipped the ball over Galea but also over the bar. The Knights then went upfield to attempt to salvage what would have seemed, just ten minutes previously, a most improbable point, and won a corner. The entire Knights' team, Gilbert Camilleri excluded, was in and around the San Gwann penalty-area, and more panic ensued in the Yellows' 18-yard box, but the ball was eventually cleared and San Gwann could breathe again. There was a slight verbal altercation on the pitch after the game in which a couple of players from both sides were involved, but the referee and the two policemen on duty soon put a stop to that. A slightly tempestuous end to game that had quite simply meandered along for 88 minutes, with San Gwann more than worthy winners. Events the next day would prove more tempestuous, in more ways than one.. AUTHOR'S NOTE: Many thanks to the gatekeeper and match-day staff at the Luxol St. Andrew's Stadium for their kindness in providing the line-ups. The 2014 Palau league championship, or, to give it its full title, the Palau Football Association 2014 Adult Soccer League, kicked off on 13/4/14. Five teams will take part in this year's competition, with three teams making their bow in Palauan competitive league action: Lyon FC, Surangel Kings and Team Friendship. They will be up against old stagers Kramers FC and last year's débutants New Star FC. All matches shall be 9-a-side and last 60 minutes, using the home-and-away format. Team Friendship picked up their first win in the league championship's first match, defeating Lyon FC 3:1, whilst Kramers FC kept a clean sheet against Surangel Kings, scoring five in the process themselves. Please find below the full fixture-list for the 2014 Palau Adult Soccer League. The 2014 Coppa Vaticano, now known as the Coppa Sergio Valci, the former president of the Attivita SDV who died last year, begins on 28/4/14 and will feature the eight teams which took part in the recently-concluded league championship, which was won for the second year in a row by San Pietro. San Pietro also won the 2013 Coppa Vaticano, and will thus be looking to win their second double in as many years. The eight teams will be split in to two groups and play three group games each, with the top two teams in each group progressing to the semi-finals, which will be played over two legs. The final itself is scheduled to take place on 3/6/14. The Supercoppa, which is played between the league champions and the cup winners, is due to be played on 9/6/14. Should San Pietro win the double, they will be expected to line up against Santos, runners-up in the league competition. Please find below the fixture-list for the 2014 Coppa Sergio Valci. San Pietro have won the 2013-14 Vatican league championship thanks to their winning the championship final on 7/4/14, but it was a close-run thing, as they defeated debutants Santos 5:4 on penalties after normal time ended scoreless. It was, almost unbelievably, the only no-score draw throughout the entire season. San Pietro had finished in fourth place in the 2012-13 regular season. Santos qualified for the final after drawing 3:3 on aggregate against Musei Vaticani; under UEFA rules, Musei Vaticani would have qualified on the away-goals rule as they had not only won their away match - both teams had won their designated away match, but had scored more goals in their victory than had Santos in theirs. Therefore, Santos' qualification can only have come about because of their finishing higher in the end-of-regular-season league table than Musei Vaticani. San Pietro's qualification was much more straightforward; they defeated Associazione SS Pietro e Paolo by 8:5 over two legs. Eight teams took part in the 2013-14 league season; those not taking part this season were Borgorosso and Tipografia Vaticana. Please find below the list of results for the 2013-14 Campionato Vaticano. The British overseas territory of South Georgia and the South Sandwich Islands, situated in the sub-Antarctic region, is one of the most inhospitable places on Earth, stuck as it is in geographical limbo in the middle of the South Atlantic Ocean between South America and Antarctica. The island of South Georgia is one of the last places one might expect football to be played, but the island has a long footballing history which it can rightly call its own, a history which stretches back for a hundred years or more, and one which owes a huge debt to the whaling industry and those who were employed at the various whaling-stations dotted along the east coast of the island. South Georgia is a rugged place at the best of times, and for those employed in the whaling-stations, life was hard, especially in winter. There were often limited opportunities to indulge in recreational activity, but football was considered an almost essential form of recreation, and a number of football pitches were constructed in different locations. Grytviken was the first whaling station and permanent settlement to be established on South Georgia; it dates from 1904 and its founding father was the Norwegian explorer Carl Anton Larsen. It is a place which features prominently in the history of football on the island; Leith Harbour, Stromness and Husvik, all founded within five years of Grytviken, are others. One of the first recorded games to take place on South Georgia took place at New Fortune Bay (now known as Ocean Harbour) in January 1914, and pitted a team representing the Grytviken whaling station against a team made up of employees of the A/S Ocean whaling company, based at Prince Olav Harbour. 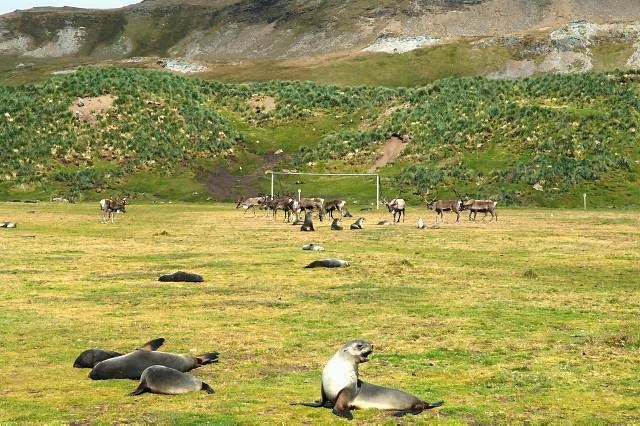 According to a quote taken from an unknown source, reproduced on the Falkland Islands' falklandstimeline site on Wordpress, the "team from Grytviken consists of Englishmen, Danes, Swedes and Norwegians and an impressive Irish player in defence. The team from Ocean is made up of nine solid built boys from Larvik and two Swedes." The Ocean team produced a more than solid performance, trouncing the Grytviken team 9:2. The team from A/S Ocean won another match against Grytviken, in Grytviken, a couple of weeks later. Nothing more seems to have been recorded about footballing life at Ocean Harbour, and the whaling station itself closed in 1920. The whaling station at Prince Olav Harbour also had a sports field, and it played host to South Georgia's first sports day on 23/2/28, inagurated by the then Governor, Arnold Wienholt Hodson, not long after the island's first sports club was founded at the whaling station; the hosts took part in a football match against Grytviken during the sports day, and it was the visiting team, which would later become part of the Grytviken Idrettsforening (Grytviken Sports Club), who prevailed. The book "The History of Modern Whaling" (1982), written by Johan Nicolay Tønnesen and Arne Odd Johnsen, claims that Grytviken's victory against Prince Olav Harbour was "thanks to the inclusion in its team of the clergyman, who had been an outstanding football player during his student days." Oddly enough, the last pastor at Grytviken church was one Sverre Eika, who was born in the former Norwegian municipality of Gjerpen in 1899. Eika was a former footballer who began his career at Odd, then moved on to Kristiania in 1918, and then on to Lyn Oslo in 1923, in the same year that he completed his theology studies. He was ordained as a pastor the next year, and came to South Georgia in 1929, and stayed for two years before leaving for Argentina in 1931. Whilst in South Georgia, as well as taking care of his pastoral duties, Eika helped maintain the football pitch at Grytviken and assisted in the organising of friendly matches. However, due to the timeline, it is doubtful that Eika was the clergyman Tønnesen and Johnsen referred to in their book. Sverre Eika, who won two caps for Norway in 1923 against France and Germany, died of a heart-attack in 1971, aged 69. No record appears to exist of the second island sports day, which took place in 1929. The third island sports weekend (as the gathering had become) took place on 22-23/2/30, with Leith Harbour taking on Grytviken in the football final at the end of the second day, the latter qualifying for the final after defeating pre-tournament favourites Stromness in the preliminary match. A report of the sports meeting appeared in an edition of the Falkland Islands-based Penguin newspaper some five weeks after the event. The report commenced in a fashion wonderfully evocative of the age: "To the Editor of the 'Penguin' from our Correspondent in the Dependencies." The final itself began in a whirling snowstorm, and, with their backs to the wind, Leith Harbour took the lead after just three minutes. Although the Grytviken goalkeeper was, in the words of the Penguin correspondent, "carrying the whole team" in the first-half, Leith Harbour went in at the break 3:0 up. They eventually went on to win by 4 goals to 1, their fourth goal apparently being the pick of the bunch. Tønnesen and Johnsen's book also mentioned that "Grytviken had the best football pitch" on the island, and that the whaling station hosted played host to the fourth South Georgia sports meeting on 14-15/2/31, when five stations - Grytviken, Husvik, Leith Harbour, Prince Olav Harbour and Stromness - entered teams for the football tournament. The Falkland Islands Government Cup was played for during the tournament. The entry-list for the fifth sports meeting, held on the weekend of 13-14/2/32, was a mere three teams, with Leith Harbour, Grytviken and a combined Husvik/Stromness contingent making up the numbers. The meeting was originally scheduled to have taken place at Prince Olav Harbour, but the recent closing-down of the local whaling-station scuppered that arrangement. The football tournament, meanwhile, consisted of just one match, featuring the teams from Leith Harbour and Grytviken, and it was the concluding event of the meeting. By all accounts, the two teams served up a cracking game of football, with Grytviken leading 2:1 at half-time. A thoroughly entertaining second-half saw Leith Harbour equalise on the hour, and, aided by an outstanding display from their goalkeeper, never looked back. Leith Harbour ultimately prevailed by 4 goals to 3 with their left-half being the star of the show, heroically playing with a broken rib. There were undoubtedly football matches between teams representing the various whaling stations on the island in later years, but records are non-existent apart the results of three finals of the later South Georgia Inter Whaling Station Football Championship which ran from 1958-61. Teams competed for what was actually a shield, which had been made in Edinburgh by the Alex. Kirkwood & Son company. The shield is now on permanent display in the CA Larsen Room at the South Georgia Museum in Grytviken. Leith won all three editions of the championship, defeating Grytviken 4:1 in the 1958-59 season, retaining the title by beating Husvik 3:1 in 1959-60, and then completing their hat-trick of titles by defeating Stromness by 7 goals to 4 in the 1960-61 decider. And there the trail of statistics more or less dries up, although matches were, and still are, played on an irregular basis on the Grytviken pitch by teams drawn from British soldiers stationed on the island, British Antarctic Survey members and those working at King Edward Point and the South Georgia Museum, who took (and take) on teams made up of crew members from visiting vessels. These teams appeared under a variety of names, as detailed in the following accounts of some of the fixtures which have been organised there down the years. A team made up of crew members from HMS Endurance defeated a British Antarctic Survey side 6:0 on 16/3/82, just days before Argentina sent a small invasion force to occupy the island, thereby precipitating what became known as the Falklands War. South Georgia Garrison - made up of Royal Irish Rangers soldiers - drew with Argyll and Sutherland Highlanders on 4/1/87; the South Georgia Garrison also played against the crew of the Soviet survey ship Professor Dubov on St. Patrick's Day the same year. Nowadays, the staff at King Edward Point, the modern-day administrative centre on South Georgia, carry on the tradition of participating in football matches at the Grytviken pitch, though their opponents are usually drawn from the crews of visiting boats and the games are more ad hoc in nature; some are 8-a-side, while others are 6-a-side. One such match took place on St. Stephen's Day (Boxing Day) 2002, when King Edward Point played - and lost 4:2 against - HMS Endurance. In February 2003, the local team took on a team from the RRS James Clark Ross; the visiting team came away with a hard-fought 3:1 win. A South Georgia United team reportedly lost two matches against RSS Ernest Shacketon (aka Shackleton All-Stars) in February and March 2005; the first, a 6-a-side affair on 13/2/05, was won by the visitors by 12 goals to 7, with the second, which took place on 4/3/05, going their way by 7 goals to 6. In June 2009, King Edward Point defeated a team, apparently made up of a number of the crew of a stricken South Korean fishing vessel, In Sung 22, by five goals to nil. The boat had caught fire in South Georgian waters and was brought to safety in Cumberland Bay. However, the boat sank some days later as it was being towed by another South Korean vessel to the Uruguayan capital, Montevideo. The South Georgia team played a team from HMS Clyde in March 2009, and won 4:0. Three years later, in March 2012, the sailors got their revenge, winning 5:0. Meanwhile, away from the action in Grytviken, the football pitch at Leith Harbour, located at the southern end of the old whaling-station, has undergone remedial work in recent times, though access is restricted as it sits within an area off-limits to the general public due to the dilapidated state of the buildings and the presence of asbestos in the area. The pitch almost played a part in the Falklands War of 1982, when the surrendering Argentine garrison at Leith Harbour, who had raised the white flag on 26/4/82, a day after their comrades at Grytviken, had been requested to line up on the pitch, but refused to do so as they had laden the pitch with land-mines. The landmines were intended to blow up a helicopter carrying the British Army officer charged with overseeing the surrender of the small Argentine garrison which had taken the island five weeks previously; he and his pilots decided at the last moment not to land on the pitch. The surrender was taken at another location close to the pitch. As part of the Fourth International Polar Year (2007-08), a survey of buildings and recreational facilities at Prince Olav Harbour took place in, curiously enough, 2009, and it was noted that a lot of work went into constructing the whaling station's football pitch, which was built by employees of the Southern Whaling and Sealing Company (SWSC). The pitch was found to measure 70 metres by 30 metres; the goalposts appeared to be intact, but had long ago fallen down. Explosions had apparently levelled enough rocky outcrops to create a gravel football pitch, and it was shored up on its southern side with foundations consisting of metal barrels filled with waste rock. It is thought that a ropeway system was used in the construction of the pitch, bringing in gravel from a quarry to the west of the pitch. At the height of the whaling industry period on South Georgia, as many as two thousand people, mostly men, may have lived and worked on the island. The few women who lived on the island, the majority of whom were the wives of the higher-ranking officials stationed there, did, on occasion, attend some of the football matches played across the island, although they rarely, if ever, appear in photographs taken of football matches at Grytviken; it appears that they restricted their attendance to the more important matches which took place. Nowadays, around 30 people live and work on South Georgia, the vast majority billeted at King Edward Point with a few scientists based at Bird Island; the local team - in all its guises - is often a mixed affair due to the limited number of scientific and administrative personnel based on the island, and its existence, albeit in an unofficial and ad hoc manner, ensures that women have found their place in the long, if still largely undocumented, history of football on South Georgia alongside their male compatriots. These modern-day scientists, soldiers and government staff take their place in South Georgian football history alongside those hardy inhabitants of the whaling-stations, who competed alongside, and against each other, from the early days in the early 1900s up to the closure of Leith Harbour whaling station in December 1965; they were the men who partook in and brought the world's favourite sporting pastime to a little, isolated, rugged and oft inhospitable island, a place out on its own at the end of the world. AUTHOR'S NOTE: Many and sincere thanks are due to Sarah Lurcock and (especially) ex-intern Thomas Kennedy from the South Georgia Museum, and to Anne-Kristin Balto from the Norsk Polarinstitutt. All photographs used in the article are under copyright, and thanks go to the aforementioned persons, and also to Kim M Kovacs and Christian Lydersen for kindly granting permission to use their photograph. The LASHIPA-6 report, which concerned itself with an archeological expedition to South Georgia, undertaken as part of the International Polar Year, was issued in 2009. Other information was gleaned from a host of other websites, including Wikipedia.